Now available as a shirt in the store! Whenever I eat an apple I’m struck by how clean my teeth feel. It reminds me of those commercials showing dogs “cleaning” their teeth while eating a biscuit. Then I eat a horrible tasting apple and I’m off them for months. I’m trying to come up with a joke involving “EXTERMINATE!”, but I got nothing. That works in the context of this, at least. THIS APPLE IS SPROUTING! EXGERMINATE! EXGEEEEEERMINATE! I need a “Whovian approved” stamp for things like this. who else read that in the appropiate mind voice? My question is, “Why didn’t they come up with this before?” They could have totally gave up on the whole Pandorica scheme and instead planted tons of apple trees. Now that they overcome the Stairs Conundrum, this was the only problem left! We’re doomed! Well, it would probably work better than most of their master plans. Their creator (not Davros) died last Thursday. Aww that’s sad. I met the man that wrote the first Dalek story years ago. He passed away in the late 90’s. In my experience apples don’t take long to start that unpleasant texture. Hate mealy. Apples are rubbish, I hate apples. But pears are worse. 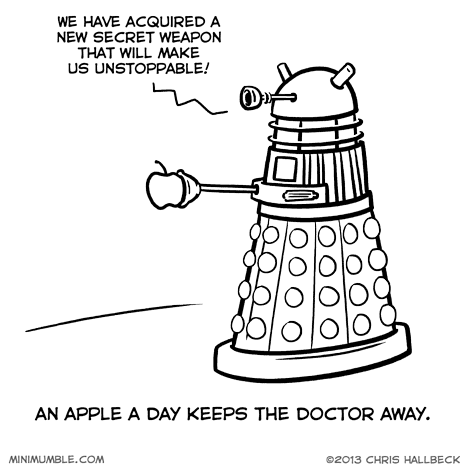 Given the Daleks’ new ability to levitate, I’m sure they’d appreciate a weapon to kill the Doctor. Cute comic, by the way. Sorry, the Whovian side of me made me comment, though I’ve not much interesting to say. Any plans to do a run of kids’ sizes? 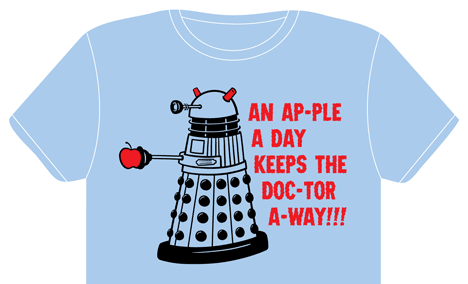 I have two young Doctor Who fans who think this is *brilliant* and want one of these shirts too.